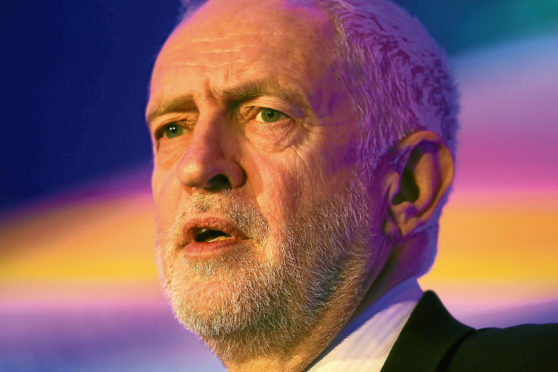 Denouncing abuse, misogyny and racism, the UK Labour leader told Dundee conference they “have to be united” to form governments in London and Edinburgh. The left-winger appealed for unity amid a bitter row over the party’s record on anti-Semitism. Mr Corbyn took to the stage at Caird Hall just hours after the Equality and Human Rights Commission (EHRC) announced it was launching an enforcement process, which could lead to a formal investigation over Labour’s handling of racism complaints. Earlier, Scottish Labour leader Richard Leonard admitted they are struggling to cope with the number of complaints being filed north of the border. Speaking at Scottish Labour’s annual conference, Mr Corbyn said the worst social ills such as falling life expectancy and poor housing can be fixed “if we have Labour governments in London and Edinburgh”. “To get there we have to be united,” he told delegates on Friday. “That doesn’t mean we have no room for disagreement. Discussion and debate are the lifeblood of our democracy. “But there is no justification for the abuse of anybody. “Racism, religious bigotry and misogyny have no place whatsoever in our movement. “And we will root out antisemitism in our party and in society at large. Nine MPs resigned the Labour whip last month, with several citing the leadership’s failure to tackle anti-Semitism and other abuse as their reasons for quitting. The saga escalated on Thursday when the equalities watchdog EHRC took enforcement action over the party’s handling of complaints. Labour has been given a fortnight to respond to the body’s concerns that it “may have unlawfully discriminated against people because of their ethnicity and religious beliefs”. Speaking to the BBC on the eve of his conference speech, Mr Leonard said there was a lack of resources available to investigate complaints in a timely manner. The party’s leader in Scotland said he was “frustrated” by the delays, which he said was down to a “resource issue”. “We want to root out anti-Semitism from every corner of the Labour Party and every corner of society,” he told BBC Radio Scotland. “There’s been a bit of a resource issue because of the number of complaints that have come in. “As a party we’re trying to deal with them in a way that’s judicious and fair to all parties concerned. Mr Corbyn told activists the party is the only one that can raise living standards for all. “We shouldn’t have a situation where a quarter of children in Scotland are living in poverty,” he said. “We shouldn’t have thousands of Scottish young people without a home. “We shouldn’t have life expectancy in Britain falling.